I had the best luck this month, scoring not one but two amazing tables. 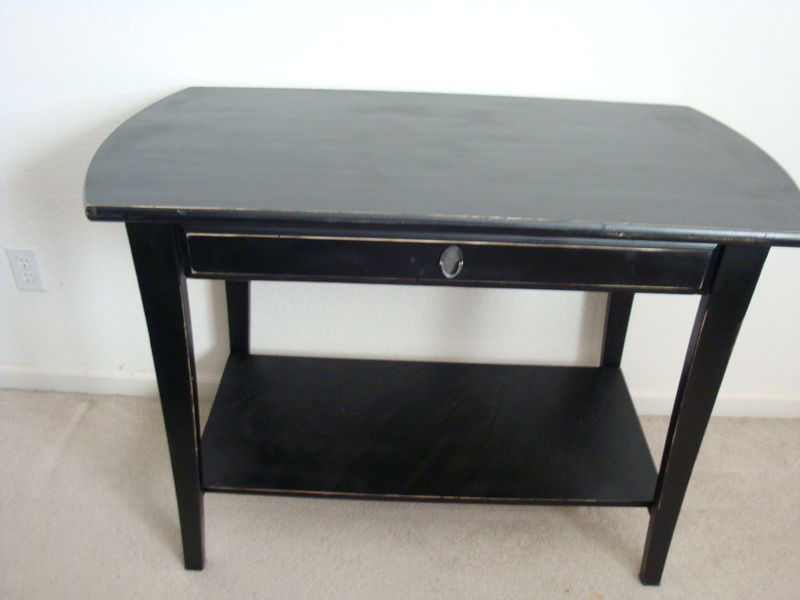 One was a flea market find -- $65 – and the best thing about it was that the flea-market vendor had bought it at a garage sale (for $15) and refinished it, so I don’t have to do any of that. It’s wonderful, see picture below. That little drawer slides like a breeze. And that little pull-thingie on the drawer? Love it. It will go in my office to be buried with paper, and the drawer will be filled with miscellaneous pencils and rubber bands, which seems like an ignominious fate, but trust me, this little table will be adored. The second one is the really amazing deal, mostly because I have been coveting it for more than two years – ever since I spotted it in a Crate and Barrel catalogue. Given the complicated nature of our dining room, which is actually our living room and is filled with eclectic pieces that work perfectly together but with zero margin for error, there’s no side-table surface on which to put stuff during a big meal when the dining table is already crowded.. In other words, I really needed a credenza or buffet or whatever, but there wasn’t room. Enter C& B and their gorgeous demi-lune console table – see below, it’s a delicate bronze-ish structure with glass top and mirrored shelf, just so lovely and so clearly made precisely for my dining/living room. Unfortunately, the price was prohibitive. And it never went on sale. Not in two full years. Plus, my local store didn’t carry it, so I would have had to pay shipping as well. Ugh. Anyway, C&B announced a new sale last week and as always I rushed to the website to see if my table was on sale. Nope. But they had a wire basket, which I also needed, so we headed to the mall. Just for fun, I went to the furniture section and … well… be still my heart, they had my table as an as-is/floor-model markdown for half price. And no shipping. Turns out they ordered it for a trade show and scratched the mirrored surface a bit. Wow. I still can’t believe it. Not only is it graceful and lovely in its own right, but it is truly the only table that would ever have worked – perfectly – with our set up. 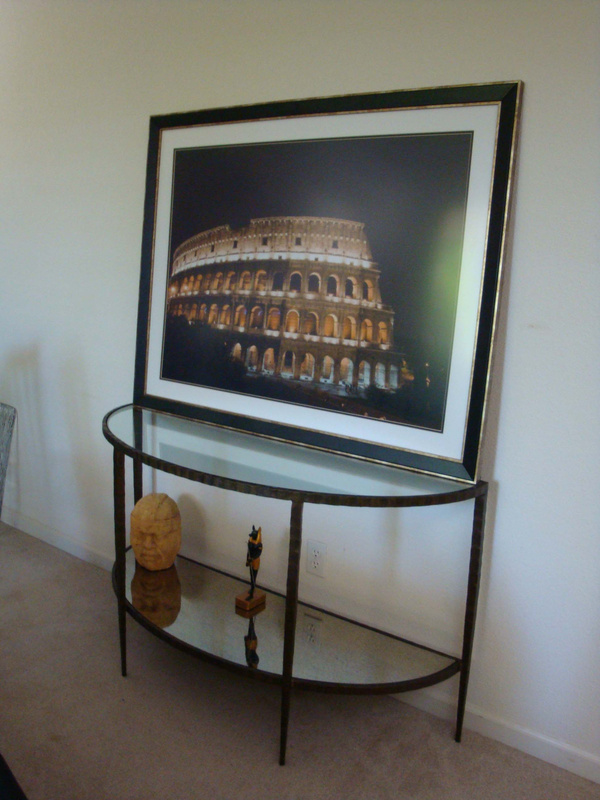 Now we can finally hang our Coliseum picture, rather than just resting it atop various makeshift solutions. And even better, we can paint that wall! As you can see from the picture, I’m still auditioning objects to see if they are worthy of living on the table. The picture will be hung soon, and it looks like the Olmec head has found a home. And the little Egyptian guy seems happy too. Every time I walk by, someone has put a new object on it, sometimes in jest (like my Voltron model or a bobbl head). It will take time, and I’m in no hurry, since I love the way this table looks when it’s empty, and I intend to use the top shelf, at least, as a sideboard, so it will almost always be empty anyway. p.s. C&B didn’t have the wire basket for my onions in stock. Where’s O’Henry when you need him? Sheesh… I guess I’ll just keep putting them in a regular basket.